Utah’s football schedule gets much easier in 2019. But is it too easy for the Utes to make a national splash? i(Trent Nelson | The Salt Lake Tribune) Utah Utes quarterback Jason Shelley (15) is sacked by Oregon Ducks linebacker Justin Hollins (11). Utah Utes host the Oregon Ducks, NCAA football at Rice-Eccles Stadium in Salt Lake City on Saturday Nov. 10, 2018. The teams could meet only in the Pac-12 championship game in 2019. Utah overcame the toughest schedule of any Pac-12 South football team to win the school’s first division title last season. Among the questions for 2019 is if the Utes play in another Pac-12 championship game, and win this time, would they have any hope of advancing to the College Football Playoff? Many variables would enter into that discussion, notably the Utes' record and how their nonconference schedule of BYU, Northern Illinois and Idaho State affects the playoff committee’s judgment. Utah is also playing Oregon State and California instead of Stanford and Oregon in the Pac-12 regular season and that could be another limiting factor. 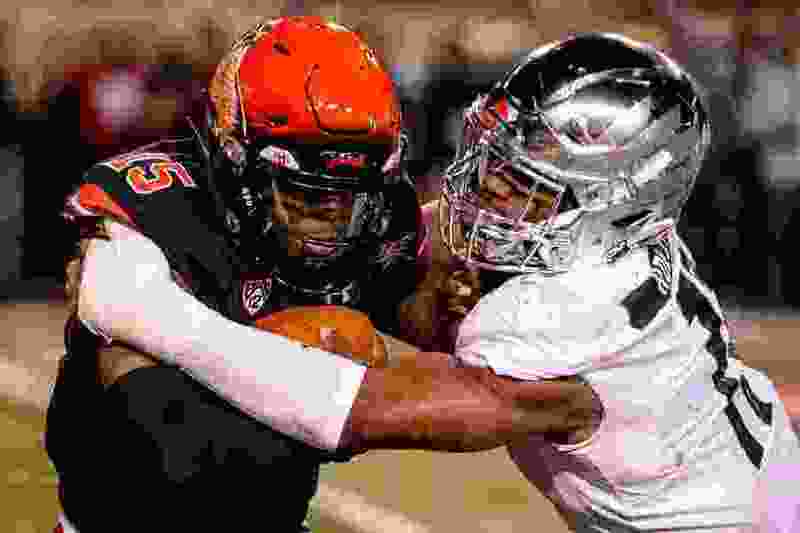 The Utes' schedule “will be an issue if they sneak into the playoff conversation,” according to Pac-12 expert Jon Wilner of the San Jose Mercury News. One set of Las Vegas odds gives Utah a 75/1 chance to win the national title, tying for the 17th-best odds. Oregon is 40/1 and Washington and USC are 50/1. BYU and Utah State are 1,000/1. If the Utes win their first Pac-12 championship but fail to earn a top-four ranking in the CFP, the consolation in 2019 will be another season that features a traditional Rose Bowl: Pac-12 vs. Big Ten. The CFP semifinals are booked for the Fiesta and Peach Bowls. The twist of Utah having played the South’s most difficult schedule last season is the Utes beat the two teams they will miss in 2019. Utah won’t see Oregon and Stanford in the Pac-12′s rotation. Based on the projected strength of North opponents, UCLA is the only South team that plays a more favorable league schedule, missing Oregon and Washington. The Bruins have a challenging nonconference run of Cincinnati, San Diego State and Oklahoma. Wednesday – NCAA's February signing date. March 4 – Spring practice begins. March 8-17 – Spring break. March 19 – Spring practice resumes. April 13 – Red-White game, 11 a.m.
Utah is sure to be the consensus favorite to repeat as the division champion, even though no team has won consecutive South titles since UCLA in 2011-12 (with USC ineligible in ’11). Utah also should be ranked in the preseason AP Top 25 for the first time in this decade, raising awareness and expectations of the program. Starting with the premise that Utah won't go unbeaten, because no team in the Pac-12's expansion era has done so, the Utes likely would be compared to another 12-1 team elsewhere. Washington made the CFP semifinals in 2016 with a 12-1 record and nonconference wins over Rutgers, Idaho and Portland State, so Utah's schedule is not necessarily an eliminating factor. The Utes, of course, have to win those nonconference games for this discussion to continue. Then, they would need to lose only once, and to the right team, in the Pac-12 regular season — like Washington, in a competitive game in Seattle. And they would have to beat a highly ranked team such as Oregon in the conference championship game. So the first checkpoint amid all of these possibilities will come Aug. 31, when Oregon meets Auburn at Arlington, Texas. That's two days after Utah plays BYU in Provo, and a victory for the Ducks would go a long way toward restoring the Pac-12's credibility. It also would mean a lot to a Pac-12 team that beats Oregon, including any of Utah's opponents. If the Utes beat BYU for a series record-tying ninth straight time, they also would need the Cougars to have a good season — but only with selected victories. It wouldn’t help Utah if the Cougars beat the Pac-12′s USC or Washington. BYU’s wins over the likes of Tennessee, South Florida, Utah State and Boise State would be beneficial to Utah, though. Arizona – Washington State, California. Arizona State – Stanford, Washington. Colorado – Oregon State, California. USC – Oregon State, Washington State. Oregon State – USC, Colorado. Stanford – Arizona State, Utah. Washington – UCLA, Arizona State. Washington State – Arizona, USC.